Like most of you, I spend a huge amount of time on the computer. In addition to spending my entire working day in front of the screen, I’m also on my computer quite a bit in my personal time. Last August, I changed jobs and once again, I work from home. While this is an incredible perk to me, it also means I pretty much camp out at my desk all day. I don’t have to get up during the day to walk down the hall for meetings or to chat with my co-workers or for anything really other than to walk to and from the kitchen for coffee or lunch. Pretty pathetic, I know. With all of that, it’s not uncommon for me to spend in excess of 10 hours a day during the week on the computer. That’s a TON of hours to just sit, and that doesn’t even include the time I spend sitting in the car, on the couch, or reading in bed at night. And to be straight-forward about it, it was starting to make me feel sluggish and rather blah. Is Sitting Really So Bad? Just Google “sitting all day”, “sitting disease”, “why sitting is bad for you”, or any similar search string and you’ll see why experts are all a bunch of Negative Nellie’s about the impact of too much sitting on our overall health, wellness, and lifespan. For me, the research on the negative effects of sitting that’s been hitting the news so often just backed up how I felt physically and mentally after sitting all day. The only question remaining was what I was going to do about it. It was time to make a stand (pun intended, and yes, I know it was pretty terrible) and sit less. I work for a truly amazing company. One of the many things that makes Automattic amazing is that we’re fully distributed, which means all employees work from home (or wherever we like) around the globe. In addition to other lifestyle factors inherent in the freedom to work from wherever we want, it also gives us more leeway than most office-based workers to customize our workspace. I think that’s pretty awesome but what’s even more awesome is the fact that they give every employee a home office stipend that we can use to buy a desk, chair, or anything else that helps us work in a more ergonomic, productive, and healthy manner. With the freedom and funding to outfit my home office (which I am ever so grateful to have), the time seemed right to make a few changes that would positively impact my health, wellness, and comfort. Even though my company was willing to pay for a new desk for me, it’s important to me to spend my company’s money in the same careful fashion I would if it was mine, so I spent months evaluating my options and talking to co-workers and others with standing desks. See? You just need a box and a trashcan. I finally decided a dress rehearsal was in order so I rigged a standing desk and used it daily for several weeks, which I highly recommend before you buy anything. For me, I wanted to make sure I would actually like it and would continue to work standing up once the novelty wore off. There are numerous resources on the web that will show you how to rig a standing desk, but you don’t need anything fancy. Anything that you can put on top of your current desk to set your computer screen, mouse, and keyboard on will do. Ideally, your monitor will be higher than the keyboard and mouse. I’ve seen people do this with boxes, stacks of books, cases of soda, plastic storage containers…in short, just about anything that can be used to elevate a computer. I ended up using a small bar-height table I have. It was just about the perfect height for me to stand, and when I needed a break, I just sat in the bar stool that went with it. I used to work in a cube farm like this. I hear ya – I’ve been in both situations and I understand. But there are still options for you if you want to sit less and stand more. For those of you in Corporate Land or other less-flexible office-based positions, you have some options. 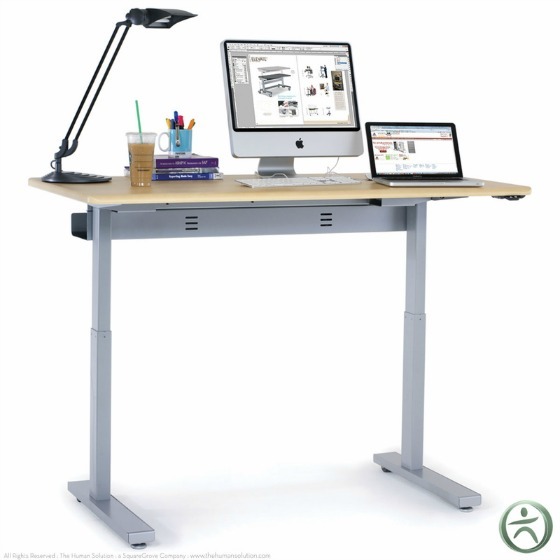 Varidesk and Ergo Desktop are just two examples of companies that offer items to convert your sitting desk to a standing desk and back again just by sitting an adjustable platform on top of your existing desk – no drilling or clamping required and no cobbled-together DIY configurations or modifications to the original desk needed. If you’re in one of those modular cubicle environments, you might be able to do what my husband’s co-worker did and convince your employer to adjust your desk to standing height since these are often just attached at a fixed height to the cubicle wall. You might want to see about getting a drafting chair though so that you can still sit during the day. If you’re self-employed or work from home and are on a tight budget, do a quick search for “DIY standing desk” or similar query for an array of free or cheap options. When I first started standing and working, I just stood until I was tired of standing – on the first day, that amounted to about 3 or 4 hours at the start of my day. I sat for a couple of hours, then stood for the rest of the day. Now, it’s probably better to start off a bit less aggressively than I did. Pay attention to your body’s cues, but generally alternating hours sitting and standing isn’t a bad idea. Once you get accustomed to that, you can gradually increase the length of the standing intervals and decrease the sitting intervals. Also, pay attention to what you’re standing on to avoid leg and back pain. If you’re standing on a hard surface, consider wearing shoes with good support or get a cushioned mat that’s made for standing, like this one. One of the first things I noticed once I started standing was that I felt better. Now, some of that might have to do with my non-ergonomic office chair, but I think most of it was related to simply not sitting all day. Ever feel like this guy after sitting all day? You know that feeling you get when you have a veg day and sit on your couch watching TV all day and then you feel like a shapeless blob with all the get-up-and-go of a sloth? That’s sometimes how I felt after sitting at my desk all day. And the longer I sat, the less I felt like getting up. After all, a body at rest will stay at rest unless acted upon (loosely paraphrasing Newton) or as my dad would say, laziness creates more laziness. Sitting or laying around all day just makes most people want to do more of the same, myself included. What Kind of Standing Desk is Right for You? There are so many options available that choosing the right desk can be a daunting task. Your budget and the degree of freedom you have to replace or augment existing office furniture will narrow things down quite a ways. You should also consider how much space you have available, what size and shape of desk you want, and if there are any particular features you’re looking for (for example, I knew I wanted a desk with electric height adjustment). Then, talk to anyone you know with a standing desk, read reviews, and go shopping. If the DIY route is for you, there are tons of resources online that can show you how to create a standing desk, including this “Best Standing Desks” list from Lifehacker. Wirecutter did a nice standing desk review too that I found very helpful. Curious to Know What Desk I Bought and How I Like It? Following the classic advice to leave ’em wanting more, you’ll have to wait for my next post (coming soon). In my next post, I’ll tell you which desk I bought, why I bought it, and how it’s going. I’ll also include some general info on standing desks and exercise desks, some helpful hacks for those on a budget or in a more traditional corporate/office environment, and links to some options you might want to check out. Snoop Dogg Loves Him Some WordPress Too!